Films often struggle in the transition to video games and television, but they tend to do pretty well as slot machines. Many of the leading iGaming providers have tried their hand at turning some of the biggest and most acclaimed films into slots. Here are our favourites. Microgaming have consistently secured and produced several high-quality pokies games based on hot film and television properties over the years – here are three of their best. One of the best comedies of the past few years made a successful transition to online gaming with this slot from Microgaming. The game features some of the film’s best lines, and also has a few really awesome bonus features, including a Wheel of Fortune-style bonus with 11 cash prizes, multipliers, and four bonus levels. 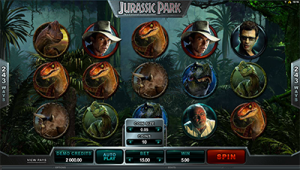 Microgaming’s Jurassic Park is one of the more graphically impressive slot games you could play. Being based on one of the most lucrative franchises in film history has helped make this slot one of Microgaming’s most popular, and thankfully the provider has lived up to expectations with an exciting gaming experience. It’s worth playing for the T-Rex alert alone. This simple slot doesn’t compare to some other film-based slot offerings, but it still does a fine job of beating the nostalgic drum and paying homage to one of the greatest action films of all time. James Cameron’s Terminator 2 stands the test of time despite being 25 years old. Even if this game doesn’t offer much in the way of huge jackpots, it has a slick presentation as well as some of the best moments from the film. 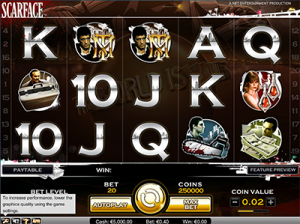 You can play all of these Microgaming pokies and more games based on popular film at RoyalVegasCasino.com. Opting for lesser known properties or niche licenses, pokies software studio iSoftBet may not have the biggest names compared to Microgaming or Net Entertainment, but they still have produced some great games based on classic films. Based on the 2008 film of the same name, iSoftBet’s Rambo is just as crazy as its namesake, offering a staggering 720 paylines across five reels. This four-tiered progressive jackpot game can lead towards big payouts with its scattered golden grenade symbols. It unfortunately does not have free games or a multiplier, but it’s still a great game that has numerous Wilds and scatter symbols. 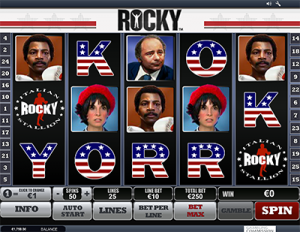 Sylvester Stallone’s famed Rocky series gets the slot treatment in yet another great film-themed slot game from iBetSoft. It offers the potential for big wins, with a gamble features that is far and few between in most slot games these days. It’s not a perfect game by any means, and its looping sounds and visuals can be a little distracting, but the Rocky slot takes some of the best lines and characters from the franchise to make for a solid game. 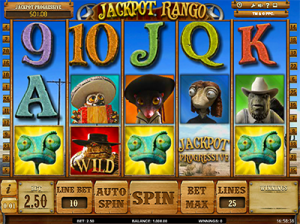 One of the best animated films of recent times made the successful transition to slot game when iBetSoft made Jackpot Rango, a 5-reel, 25 payline game with numerous ways to win big. This themed slot adds some interesting bonus games, Free Spins, Wilds and a potentially huge progressive jackpot. While a bit of a weird theme to adapt into a real money pokies game given the target audience would be below the age of eighteen, it still has proven to be a massive hit with pokies enthusiasts. Net Entertainment have made a name for themselves for making some great real money video slots based on new release and classic films, with a wide range of diversity. NetEnt is known for its many great film-based slots, but its Aliens game may just be at the top of the pile. This engrossing slot has a number of unique gameplay features, notably its thrilling story-based levelling system that can lead to a battle against the Alien queen. 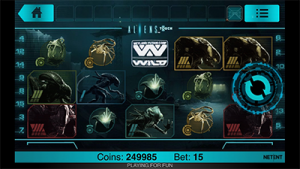 Free spins, great graphics, and a truly unique design make Aliens from NetEnt not only one of the best film-based slots out there, but arguably one of the best real money games you can find. This slot from Net Entertainment has everything you could want from a slot game based on the iconic 1983 film Scarface. Its presentation perfectly represents the film’s major themes of wealth, power and business. It has four different Wild symbols, meaning the action is constant, while the stacked Tony symbol kicks off a cinematic mini-game in which you must protect Tony from a hit squad. It’s far more violent than most other slots, but that doesn’t make it any less good. 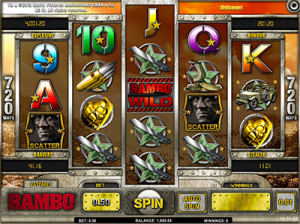 It’s yet another fantastic addition to NetEnt’s slots portfolio. 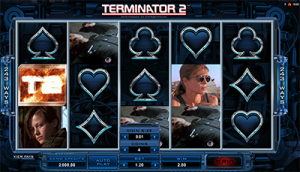 NetEnt’s finest movie-based pokies can be played in instant play no download mode at Guts.com.